The AFC3 core unit is based on Yamaha’s well-known DME64N digital mixing engine. The enhanced AFC3 version of this processor includes the expected matrix mixers, delay lines, parametric EQ’s, and routing functions as well as specialized DSP components developed specifically for AFC applications. 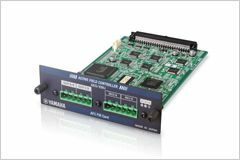 While one card slot of the AFC3 processor hosts a card dedicated to the FIR processing functions, the remaining three MY-card slots provide the first 22 channels of outputs to the AFC system. Additional AFC3 units may be added and linked to the master unit for additional outputs.